After having it hovering on my wish list, I splashed out on The Apocalypse Suite. 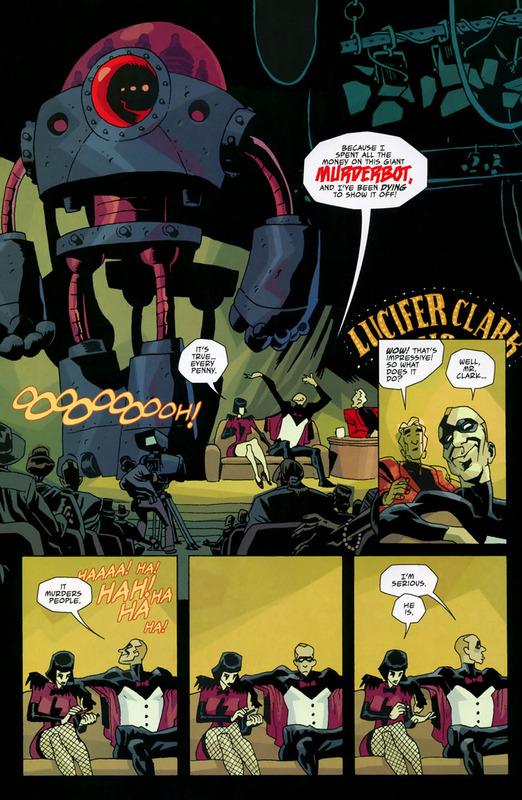 The collection includes the FCBD book from Dark Horse, of which two pages are reproduced below as an example of the art, humour and sensibilities of the book. And THAT's how you use a beat panel. Ooops. you have the 1st page repeating. Next time, Gadget, next time!!! +50 Geek Points to you, sir/madam. This just made me laugh. 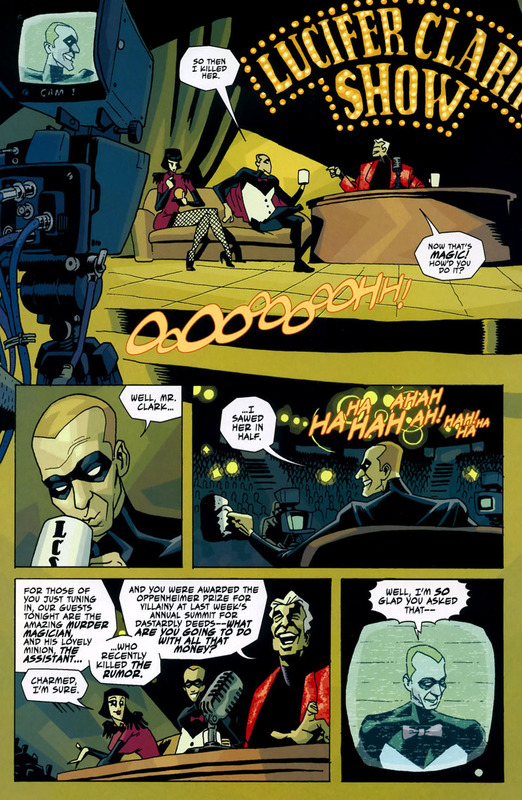 What a brilliant idea, a super villain talk show. i think I'm going to go pick this up! That second page is gold. First they don't know what the MURDERBOT does, then they think its a joke when it, you know, murders people. Reminds me of the old Frantics radio show. One of their regular skits had plucky boy hero Todd Booster facing off against his nemesis, MuMu Bunnylips. One episode had MuMu creating a massive death ray on the moon, capable of causing massive death. Actually, that was the bit that lost me; he's already been introduced as the Murder Magician, and the audience laughed and cheered, so NOT picking up on the fact the Murderbot does exactly that and it all goes quiet just didn't work for me. The "I'm serious" seems... lost somehow, we know he was serious, and the audience NOT getting it seemed weird. I can kinda see it. At least if you're looking at legal definition of murder, rather than just killing people. Big clumsy thing like that and murder might not be the first two things to be thought on the same context. Though I think it's just a play on the format of these shows, in which case we'll come back to whether it's actually a good one. But I digress. And go on overly much. Honestly, I was skeptical of this book because it was written by Gerard Way, but it is actually really good. My friend owns Apocalypse Suite and I have Dallas. We exchange when we feel like it because this series is just awesome. I tried to like Umbrella Academy, I really did, but there's a point where everything is given too much eccentricity that there is no more point of reference. The police characters that are the most common 'normal' characters that appear, plus the unlucky diner lady, but that's really it. It didn't even take long for the one supposed normal member of the family to go 'boom'. If the world is really that strange, with for example, fully intelligent monkeys who are working members of society from policemen, soldiers to prostitutes, then what exactly is special about the members of the academy anyway? I was surprised though, that the most relatable person in the second volume of the series ends up being Seance. I didn't really expect that to happen, but his little Vietnam baby is really too freaking adorable, and amongst every other member of the family, he's the only one who actually seems to be competent in doing crap alone or otherwise. Just to make it clearer, the eccentricity of the universe is one thing (the book is saturated with eccentricity, to the point normality is the exception, and that kinda defeats the purpose of the UA family being chosen for being unique), but that the main characters are near zero in terms of being sympathetic. It got a bit better in the 2nd volume, but I was only rooting for The White Violin in the first book if only because the rest of her family were seriously big whiny jerks. 2nd volume, they grew, but I feel only in the sense they stopped pretending to be heroes and their natures were easier to digest. Except for the surprise development of Seance into being the most proactive member. Reminds me of "David Letterman" interviewing the Joker in Dark Knight Returns. I was going to say. I hate saying anything nice about Frank Miller, but Miller did it better. How is that bowtie staying on?